Senators voted to confirm Russell Vought as deputy director of the Office of Management and Budget, after Vice President Mike Pence cast the tiebreaking vote Wednesday with the chamber deadlocked at 49-49. 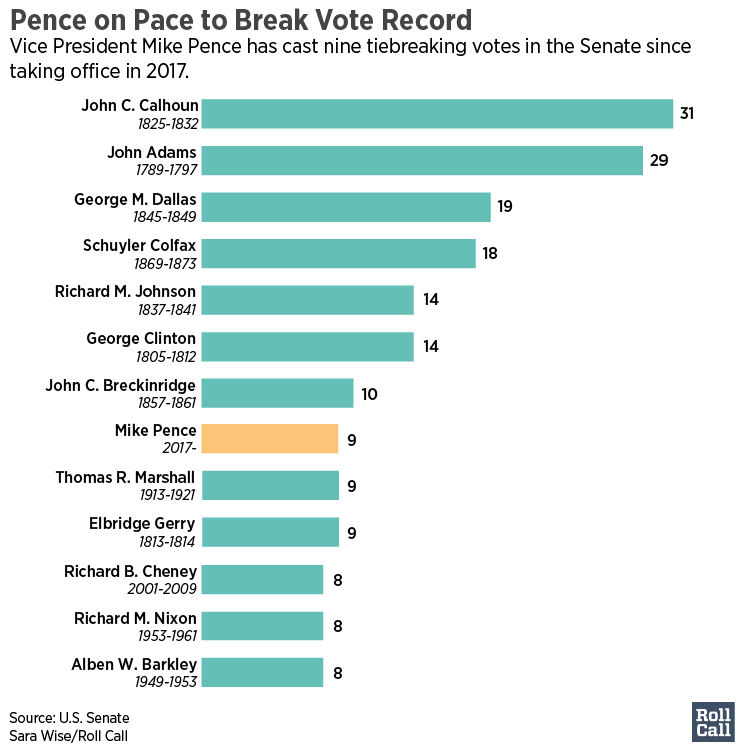 It was the ninth time Pence has broken a tie since he took office last January. GOP Sens. John McCain of Arizona and Mike Rounds of South Dakota were absent, necessitating Pence’s drive down Pennsylvania Avenue as the Senate split along party lines on the vote. An extremely close 49-48 vote to end debate on Tuesday night foreshadowed a razor-thin tally for confirmation, though opposition wasn’t fierce enough to prevent a time agreement among all senators for a 4:30 p.m. roll call vote. A few absences and the GOP’s slim majority raised the possibility that Pence would have to cast a deciding vote, as senators also voted along party lines a day earlier. Democrats have criticized Vought, a former aide to the conservative House Republican Study Committee and vice president at Heritage Action, for his views on both fiscal and social issues. Vought did not get a single vote from Democrats last June in either the Senate Budget or Homeland Security and Governmental Affairs panels, with his nomination reaching the floor on the back of GOP-only support. Vought arrives as a deputy under OMB Director Mick Mulvaney as negotiations are heating up over the fiscal 2018 omnibus, now that lawmakers have agreed to provide appropriators higher spending limits for defense and nondefense in law. But continued disagreement in Congress over how to spend the extra money means appropriators still haven’t publicly released a plan for how they will divide discretionary funds across the 12 subcommittees. Current funding expires March 23. The move also comes after President Donald Trump’s administration has already produced two annual budget requests.